Landing manager Carl Schmidt from Fisherman's Landing called in an Audio report today. All the boats had Yellowfin Tuna Limits. 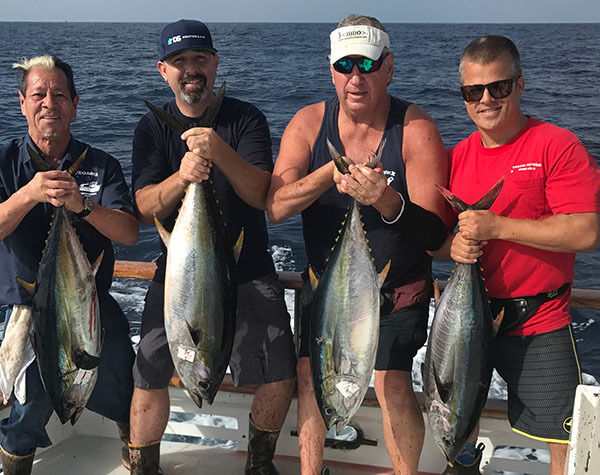 Condor had 90 Yellowfin Tuna for 18 anglers , Fortune on an overnight trip had 100 Yellowfin Tuna 10-15 lb range for 20 anglers, Liberty on an overnight private charter had 45 Yellowfin Tuna for 9 anglers, Pacific Dawn on a 2 day trip had 50 Yellowfin Tuna for 10 anglers 12-20 lb range, Pegasus on an overnight trip had 90 Yellowfin Tuna for 18 anglers, Pacific Queen on the 2nd of a 3 day trip had limits of Yellowfin tuna both days. Most of the boats are starting to see a better grade of Yellowfin 15-20lb some saw 40 lb. Great weather right now. If you are going out bring a bigger outfit 20-25lb and a 30-40lb outfit too. Give us a call and get out on one of these trips.